If you pick up your phone and call Dave & LJ’s RV Interior Design, you’ll probably be greeted personally by co-owner Dave Ast. “I try to handle all of the calls myself,” Dave says. “I can answer any questions about what we do, and that can save everyone a little time.” What Dave and his brother, LJ, can do is make your RV look new again – or better than new. They sell, install and service furniture, window shades, flooring, state-of-the-art electronics and beautiful cabinets at their big new facility in Woodland, WA. It’s a craft they learned working in their father’s shop more than three decades ago, and those years of experience are reflected by the quality of work done in their shop. 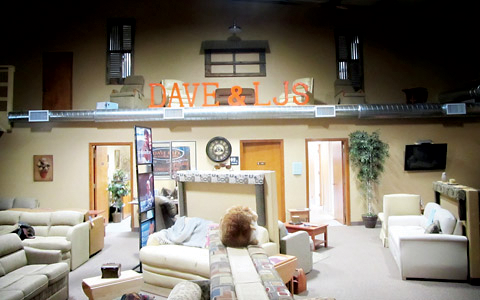 Dave and LJ first opened a shop together in 2007, and their new 12,000-sf building in Woodland with five service bays is a very busy place much of the year. If your RV needs a major facelift or a full interior restoration, you should talk to Dave several months before you plan to get get that work one. But if you need a new seat installed or a countertop replaced, just drive on in. But it’s always best if you can call ahead. Although they have the largest RV furniture and interior products showroom on the West Coast, they are often fully booked for large jobs months in advance. Need some privacy? Dave and LJ offer AutoMotionShades, a two-part, day-night roller shade system with either manual or powered operation. The day portion of the shade is a solar sunscreen giving great visibility looking out of the coach, while providing privacy from anyone looking back in. The night portion of the shade enables you to completely block all light from coming into the interior of your RV. Furniture showing signs of wear? They carry all the latest models and styles from Flexsteel, Villa, Lambright and more, with a multitude of coverings and colors including leather, ultra-leather, vinyl and fabrics. Looking for more light in your kitchen? Their electrical team can install high-efficiency LED lighting that allows you to see with ease. Need new countertops? Using only the highest quality lightweight and durable materials, they can modify or replace your countertops with Corian, tile, linoleum, or vinyl. More storage in the bedroom? They have a lot of experience squeezing out every last square inch of storage in bedroom areas. Finding space for electronic equipment in your RV can be a challenge, but the techs at Dave and LJ’s do a lot of installations and can offer a wide choice of mounting systems, locking swing arms or cabinets with power lifts to place your TV screen just where you want it.